I received a call from Michele a couple weeks back and she knew of me from an event I shot at Bottle & Bottega in the summer. She and her fiancé were planning a civil ceremony in a town close to where I live. I was happy accommodate them and be one of the 5 select people at this event. I stopped by the courthouse the day before and was initially a little concerned. The parking lot and the courthouse weren’t going to make for very interesting images. I started to wander around the neighborhood a bit and pretty quickly discovered this really nice park right next door. Yay! It had plenty for me to work with and I mapped out a path of things we could walk through in a short period of time. After our quick shoot in the park, we walked over to the courthouse. There were two other couples waiting to be married but Michele & John were first. The judge was pretty funny. His name was Mr. Fullylove - and he joked about how appropriate his name was for his purpose in the days events. Ten minutes later, Michele and John were married! Congratulations to you both! You never know what a new connection will bring you. I start with this because this is how I came to edit the video for Michael & Marianne’s wedding video. I reached out to Steve Kang, a Facebook acquaintance that I knew from some photography groups we’re both a part of. I asked him to lunch because it seemed like we were bidding on the same types of jobs and I asked him if there’s anything he’d like to collaborate on. Turns out, he needed some help with an edit on a wedding he shot and had been sitting for a while. We agreed that I’d do the edit in trade for him helping me with some production work (blog post and details coming soon). Like so many things, it just wasn’t that simple. Most would “Yada, yada” over the best part and say, “Everything went great, the edit was easy, and nothing went wrong along the way”. If you want that version, skip to the last couple sentences. As you can guess, that wasn’t my experience. To start, I had already been behind on some other projects so I didn’t even look at this material until a week after I had the files. Shortly after I started the edit another job came up (which is what Steve helped me with) and now I’m behind by two jobs. Oh boy. Its a nice problem to have but I hate the feeling of the ball being in my court and owing someone. I want it done so I can move onto the next thing. Meanwhile, I’ve been working on changing my technical workflow in my business. Painful to go through with the promise of better organization in the future. While I was hard at work on the edit of the wedding, my editing hard drive failed. Yikes! Not. Happy. I look up places locally to recover data and found one not too far from the house. Fortunately, they were able to recover all the data off the drive. I, of course, had a back-up of all the data on that drive except for the wedding edit. I got the data back and now have a back-up of everything and also have a nice video to share of Marianne & Michael’s wedding. I’ve posted a small portion of the edit here since the full version is about 30 minutes long. Enjoy! Back in September of 2013 I was asked to capture the ceremony with video for Emily & Christopher. It feels like so long ago at this point that I had initial discussions with the bride's sister, Alyssa. The goal was to capture a sense of being there and put together all the material that I would capture in a relatively short period of time. The ceremony was about 25 minutes (and it feels even shorter when you're focused on capturing the event vs. attending). I was a one-man show for this wedding so I was running quite a bit during the ceremony. I arrived about an hour early to get set up and one task I had when the groom arrived was to mic him up. When reviewing the audio, I noticed that I captured these really nice moments between Christopher and Emily during the ceremony. Unfortunately, they were just too low for me to integrate into the video. He whispered things like, "You look beautiful - I love your dress!" and "...are you nervous?". Very cute. Congratulations to you guys. It was a pleasure working with you and your family. Recently, I photographed the wedding of Erin + Brian with a good friend of mine, Erin. No, that wasn't a typo. Two Erin's. I started with the groom and his family. We grabbed of shots of the family and I also had the pleasure of coming up with some shots of the rings. Although I've received mixed reviews (you know who you are), I happen to like this one and when I showed it to the groom he seemed to like it too. 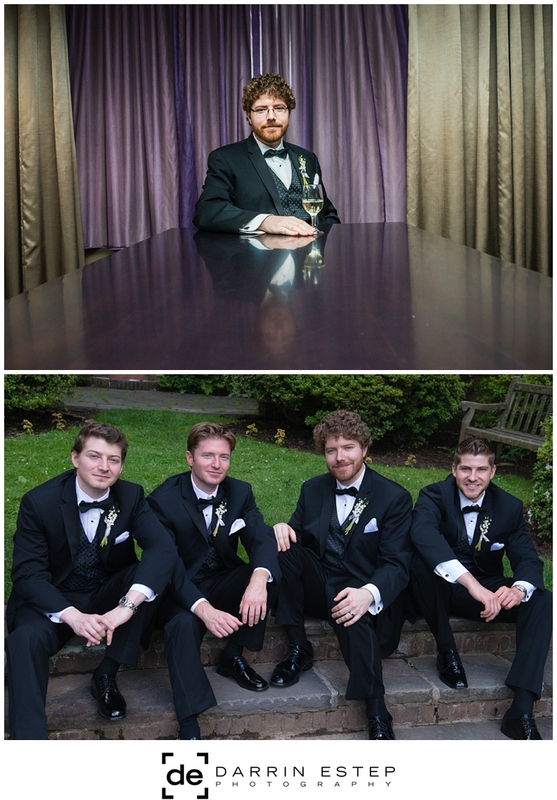 These images were from two different times in the day, but both of the grooms side. I wanted to do something a little different with the groom at the table. They had a suite at the hotel so it provided me with the decoration for the rings and this great table for the groom. Finally, some images of the church, the newly married bride and groom and some refreshments from the cocktail hour. I'm feeling like its time for a drink, you? Notice the range of emotions on the faces of the girls as the bouquet falls. Rounding out my edits from weddings shot last year. One thing that resinates with me when I shoot weddings is the interaction and respect within the family. It makes me think of the saying that goes, "you don't just marry the individual, you marry the family". I feel like the values and behaviors of the family come through in the individual. This family was no exception. The day started out a little rough for me since I tore a nice little whole in my rear bumper while backing into the driveway of the grooms parents house. Breathe. Focus. Put on the happy face and let's get some nice pictures. No damage was done to their place but the back of the car didn't look so good. I tried to quickly put the incident behind me and focus on the task at hand. Fortunately, I was greeted by a bunch of really nice guys. We moved outside for some shots around the house with the family. They actually suggested this jumping shot (I did a few of these last summer) and this one turned out pretty well. My favorite is the guy on the left. Too funny. Okay, onto more serious things. I met up with David (photographer I was shooting with at this wedding) and got a chance to shoot a few with the soon-to-be husband and wife. Finally, I wanted to feature a bit of the food. When I say they had a spread, I really mean it. I have probably 20 images of different selections of food. Meat, veggies, cutting stations, ice sculptures, olives, shrimp, pizza, bread, pasta, and on and on. It was amazing. Here are four I liked. Hope you're not hungry. Even though this wedding was last August, its still pretty clear in my mind. This couple was probably the most casual about rules and tradition that I've seen in my time shooting weddings. They weren't concerned about hanging out together when getting ready for the day. They were however concerned about having friends and family around to share in their day. Amanda and James had fun. All day. They also showed such sincere engagement toward each other. Starting with some hair and make-up, we shot in a small hotel room with lots of activit. This was a favorite of mine. A little set-up but you'd never know - oops, I guess I just spilled it. I also love grabbing details of things that are around the room like a shot of the bags on the couch. Each wedding is a little different. Different cultures, different family dynamics, some traditional, some not, some very long and others relatively short. One thing that’s true every time is that this is one of the most important days in this couple’s lives. It also seems consistent that if the bride and/or groom was nervous in the minutes leading up to the ceremony, most let go and have fun once they seal it with a kiss. Michael is like many grooms that I’ve recently met. On the outside anyway, he seems pretty easygoing and just happy to have friends and family close when he makes his commitment official to his bride-to be. The preparations for the groom are such a contrast to the bride’s. There is no make-up artist, nobody getting their hair done and usually takes all of 20 minutes for the entire set of groomsmen to go from casual to fully dressed. When I cover this part of the day, most of the images are taken in the last few minutes before the limo arrives. Melissa, on the other hand, had a way of communicating how she felt through her facial expressions. I put together this series of six images that span a five-minute period while the toasts were being given. I have to admit that I don’t know Melissa that well, but I’m pretty sure you would always know where you stand with her, good or bad. This doesn’t happen at every wedding, but sometimes the couple will make an extra effort to add something unique to the event. For Melissa and Michael, they had a special fire truck (since he’s a volunteer firefighter) and a car that reminded me of the Dukes of Hazard for their getaway. Best wishes to both of you. So glad I could be a part of your day. I met Nicole and Ryan on their wedding day when I was asked by Dan (a fellow photographer) to help cover the event. Dan and I joined Nicole, her mother, and the bridesmaids in the bridal suite to capture some details (shoes, dress, hair & make-up, etc.). Nicole seemed so at ease as she sat for the finishing touches on her hair. Being surrounded by such close friends and family helped, I'm sure. One of the favorites from the morning was this one of her making sure all was good through her compact mirror. I only stayed for a few minutes with the girls then drove to get some time with the groom for his preparations. Once I rounded the corner to the grooms parents' house, I knew I was in trouble because I noticed the party bus had already arrived. My first thought is that I had very limited time to get what I needed. As I entered the house, I said hello to Ryan and asked how much time we had. He said, "About 10 minutes. Is that enough?'" Sure :-) We can make that happen. We set up a couple scenarios. Snap, snap, snap and they were on their way. When I got to the church, I had a quick look around and saw great opportunities to get some interesting perspectives during the ceremony. They had a balcony in the back and on either side of the church. I was able to roam about to get images from unexpected vantage points. This day was one of the hottest of the summer, so we were fortunate that most of our shooting was indoors; however, we did get outside for some of the formals. With such a nice backdrop of the NYC skyline, we took the opportunity to work it into the shot. The girls were particularly silly which I loved. The rest of the night was focused on capturing people having fun. No problem at this wedding! They had a great band called Night Moves which were fantastic, especially when the bride joined in toward the end of the evening to lead a Billy Joel cover. During the Memorial Day weekend I took a trip down to Maryland to second shoot a wedding with Sunny, a photographer I met at Suman & Rishi's wedding two years ago. I knew it was going to be a long day 8am to midnight plus a 3+ hour drive so I made arrangements to arrive the night before. It was an easy drive and it was a particularly hot weekend. I made it to the first location which was a hotel with a nice open space where they started with some pre-event pictures. Well, pre-event for that day. This was day two of the wedding which is often true for Indian weddings. Here are a few I captured along side Sunny in the morning. With a Hindu wedding procession, a baraat is when the bridegroom enters on a horse and rides up to the venue with lots of dancing and general celebration along the way. Here are a couple images I captured during these celebrations and the ceremony. I tend to gravitate toward the cute kids at any event I'm covering. Here are a few images from the kids at this wedding. I love it when I can capture a special moment that they'll look back on someday. Congratulations guys! What a fun event! Kate & Jeremy are the type of couple you hope you come across at some point in your life. They have so much going for them: friends all around, family that clearly loves them, and what you see from them is giving that love right back. I had the pleasure of photographing their wedding on June 2 in Sayville, Long Island at the Land's End Resort. The day started at Kate's parents' home. Here are a few moments with Kate, her sisters and friends getting ready for their big day. At Land's End, a small crowd gathered for the excitement of the first look between Kate & Jeremy. Next up were some formals. These are a few of my favorites. Vivian, the flower girl, chatted about her new dress and stopped long enough to smell the roses. Food was served and the ceremony began, officiated by Jeremy's step-father. It's always more fun when couple's aren't too conservative with this tradition. They had fun with it! Some jumpin', dancing... and boom, the night was over! Thanks again, Kate & Jeremy. I really enjoyed spending the evening with you, and capturing your special day. Also, a big thanks to David Grogan who was such a help, all-around second shooting and assisting with lights throughout the night. For the full set of images, you can visit this page. As a follow-up to my previous post for the wedding of Marian & Antwan I wanted to put together an album layout from the images captured as a second shooter. It doesn't give you the entire flow since my role is to help the primary shooter get what he needs. There were however, a few opportunities for me to capture images and what I'm posting here is a result of those moments. I picked out a few of my favorites to give you a sense of how I experienced the event from start to end. I arrived in the morning with the task of shooting the groom getting ready. Uh, didn't work out exactly because they were already ready! Hmm...go with it, right? So, we shot a variety of shots with the guys in the house where they were getting ready. There was a really cute little boy that I wanted to feature. The image below is the result. I also shot some reflection off the party bus as the guys were waiting to jump in. Kind of different. This was a Egyptian couple and the church had some interesting detail. By the way, I was really thrown when people were chanting in the ceremony. Everyone has their traditions and it's interesting to be an outside observer. Just wish I had some audio to share with you to give you a sense of how it sounded. Since the priest was running a few minutes late, I was lucky enough to get a few minutes with the bride to shoot a couple images. She was beaming on her special day and is as nice in person as she appears to be in pictures. A couple shots of the bridal party and a quick capture of the bride and groom during the ceremony. This shot of Marian & Antwan just after they exited the church is one of my favorites. Finally, a few of the first dance as bride and groom and the dance with their parents. Congrats guys! This was the first time I worked with Mike and his crew, and they were such a nice bunch of guys. Two were shooting video and we all had fun working this event. I'd love to work with them again. A few weeks back I saw a posting on a forum for a second shoot opportunity...and it was local...well, kind of. I very quickly put together an email and ended it with the hope that I'd hear back. As I'm sure you've already guessed it, since I'm writing this post, I did hear back in a favorable way. A few days later, I met Mike (the primary shooter) at lunch in the city and we discussed the couple and the details of the day. Back in the fall of 2009, I asked a good friend that was getting married if they would be open to me shooting their engagement pictures. She (Suman) checked with her husband to be and he was interested so we picked a date and found a really nice place in Central Park to shoot. It was a really nice day to shoot because the weather was cool but not cold and the colors of the fall were in full bloom. I've posted a few of the images from the engagement session here but for more of them, check out the set on flickr. So onto the video. The wedding itself was 3 days long with multiple events. The first was the Mehndi ceremony on Wednesday afternoon. During this session, I shot both stills and video. It was a great way to kick things off. Next was Sangeet at the groom's parents house. So many colors and creativity from the children to the grandparents. Everyone got involved in the singing, dancing, and just general celebrating of life. Last was the day of the wedding. In the morning, we started with a Chuda and Haldi ceremony. Then comes a break and final preparation for the wedding and reception. Actually, its probably best if I stop describing it with words and show you the images. Suman & Rishi's wedding highlights from Darrin Estep on Vimeo. There's so much more to talk about with this wedding (which is why I named this part 1). Stay tuned for more behind the scenes in putting this together and a shout out to all the great people I had the pleasure of meeting and working with.